It's 1492 all over again. This time the stakes are higher. There's not just a few continents to discover, but tens, hundreds, or even thousands! It seems every 500 or more years, humanity oversteps its confines or boundaries and expands its horizons, in both the physical and spiritual sense. I call it the Eris cycle, since this newly discovered planet has an orbital period of 558 years, and may very well be the trigger mechanism for these centuries-long resets. Eris may rule Libra, but here on the physical plane, we always experience the night side of Libra, which is Taurus -the sign of land, matter, and wealth. Same happened with Pluto. Pluto rules Scorpio but on this plane we experienced the other side of Pluto which is Aries or war(World War in this case because Pluto always does things on a grand scale). So Eris tells us that we will come into more land and the wealth that comes with it, only on a very vast or grand scale. Eris enters Taurus in 2044, so it will be almost three decades from now (2016)before we will actually see the promise of this unfold. See my other article entitled Eris and the Flat Earth. Recently, a map or diagram dating some 1000 years was released on the internet showing 30 plus other continents around our known flat Earth.This diagram is shown below. 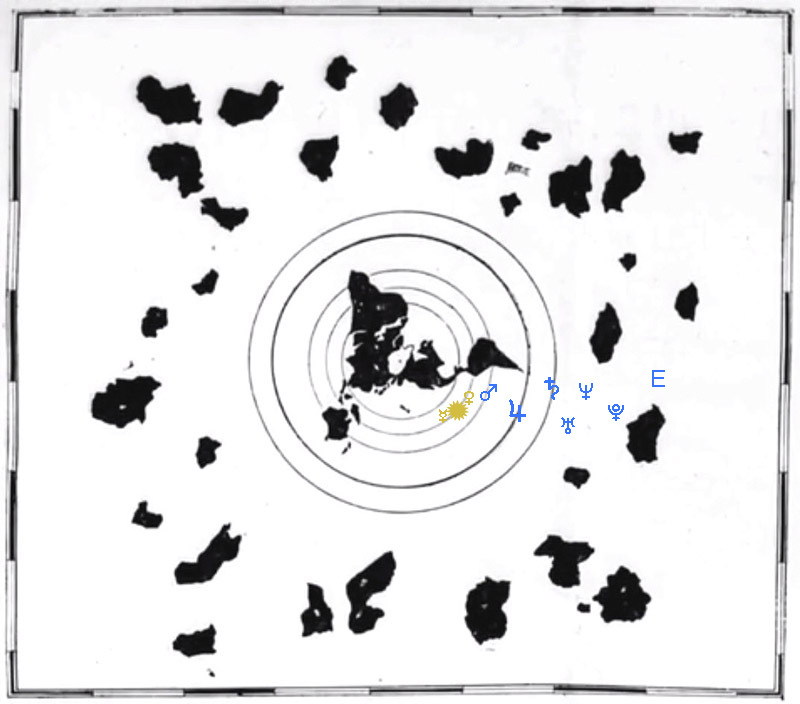 and Eris(E) is the general "more land" and peoples area. Not sure about the Moon, but not far from the Sun. Whether this map is true or fabricated is uncertain, but it points out the very real possibility that there are indeed many other lands or continents, beyond what we know to be the Antarctic. And why not. What a dull universe this would be if our world was limited to the seven continents we are familliar with. My good sense tells me that our universe is an infinite and reachable vastness of wonder and exploration, and that we are on the verge of actually realizing this. What does this mean spiritually? It means that our spirits(and minds) are expanding as well. We are creative beings with endless potential, and the physical plane reflects this. Whatever we can imagine we can ultimately create or express tangibly. There must be thousands and millions or more species out there for us to discover -all the products of divine imagination or creativity. What about the Arctic? There may be more land there as well that we have not been told about, and/or more likely there is a hole, mouth, entrance, gateway, or portal to the Underworld. This may explain why the nations of the North are so preoccupied with war and dominance -they may be under the direct influence of these Hell worlds. Just as the European colonialists expanded to Australia and the Americas over 500 years ago, so will we expand to still other continents in the next decades and centuries -only on a much larger scale. This awakening began in 2015-16 when Uranus(the planet of awakenings) conjuncted Eris, the planet of vast land and wealth. Eris is now(2016) at 23 degrees of Aries, or the EXACT sign and degree it was in 1492! Is this a coincidence? I think not. Eris in Aries profits from war and aggression and this is our situation now, but this will change in 2044 when it moves into Taurus. Things will be a lot more peaceful and productive then.